Universal UK will release science-fiction tinged horror flick Altered on DVD on December the 26th. The film, which was directed by The Blair Witch Project's Eduardo Sánchez, is about a reunion of four men who, having survived being abducted by aliens, are bent on revenge. The movie stars Nash Bridges' James Gammon. If you don't count the Curse of the Blair Witch TV spinoff, this is Sánchez's first film as director since 1999's The Blair Witch Project. The film will be presented in 1.85:1 ratio. No other technical details were announced, and there was no information about about any bonus features. The RRP is £12.99. 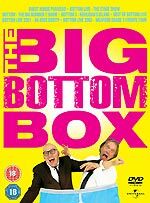 Universal Pictures will release a DVD set called The Big Bottom Box on November the 27th. It features five Bottom live shows starring Rik Mayall and Adrian Edmondson (1993's Bottom Live - The Stage Show, Bottom Live - The Big Number 2, 1997's Bottom Live - Hooligan's Island; 2001's Bottom Live - An Arse Oddity, and Bottom Live - Weapons Grade Y-Front Tour), Best of Bottom Live compilation (which includes a Making of... documentary, and bloopers from Guest House Paradiso film), and the 1999 film itself. RRP for the set is £39.99. 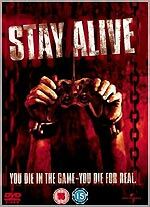 Universal UK will release William Brent Bell's horror flick Stay Alive on DVD on December the 4th. The film is about a group of teens who discover that the deaths of some of their friends is linked to an online video game called - irony of ironies - Stay Alive. The film stars The O.C. 's Samaire Armstrong, Life As We Know It's Jon Foster, and Malcolm in the Middle's Frankie Muniz. No technical details were announced, and there was nothing in the press release to indicate whether there would be any bonus features. Neither does the press release indicate whether this 15-rated version is the original US theatrical version, or the US DVD's Unrated Director's Cut. The US DVD has a commentary track; a visual effects reel; and "interactive bonus menus". The RRP is £19.99. Universal UK will release babes-in-bikinis action movie DOA: Dead Or Alive on DVD on January the 8th. The film, which stars Neighbours' pop diva Holly Valance, My Name Is Earl's Jaime Pressly, Shark's Sarah Carter and Sin City's Devon Aoki, is about contestants participating in an infamous martial arts tournament. Eric Roberts plays the villain (Whoa! Did anyone else just get a Best of the Best flashback!) The film was directed by The Transporter's Cory Yuen. The film will be presented in anamorphic 2.35:1 format. Deleted scenes and a Making of... featurette are also offered. The RRP is £15.99. 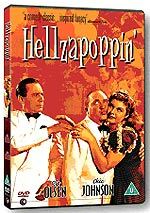 Second Sight will release the wacky Broadway musical-based 1941 movie Hellzapoppin' on DVD on February the 5th. Pathé Distribution will release British horror film Severance on DVD on January the 8th. The film, about a bunch of colleagues on a corporate team-building weekend who become the target of blood-crazed soldiers, will be presented in anamorphic 2.35:1 format, with Dolby Digital 5.1 audio and optional English HoH subtitles. The disc will also feature a commentary track (by director Christopher Smith, writer James Moran, production designer John Frankish, and stars Danny Dyer, Tim McInnerny, Babou Ceesay and Andy Nyman); deleted scenes with optional commentary (13m); outtakes (2m); a Making of... featurette (33m); featurettes Being Danny Dwyer (6m), Not So Special Effects (5m), The Genesis of Severance (5m), The Coach (8m); The Bearpit animatics (3m); alternate ending storyboards (1m); UK theatrical trailer (3m) and the company's corporate video (2m). There'll also be an Easter Egg (click and drag to reveal): Nadia and Olga Interview (6m).